There are a few things I am a sucker for: loose change lying in a busy street, a smart dame and new items at White Castle. You may recall my previous investigation involving the White Castle Belgian Waffle Chicken Sandwich. This time my investigatory reporting was hindered by the lack of my trusty assistant. CMH Tobias was unable to eat pending surgery so I had to have Mrs. Gourmand step in to aid my culinary journalism. However, she was hindered by her own condition (knocked up by this writer) so that her olfactics which are heightened off the charts normally are further expanded by her pregnancy hormones. My own drive to investigate was augmented by a strong desire to eat something other than pizza (the defacto food de jour at Chateau Gourmand since November due to the odd food obsessions and peculiarities that come with knockupedness). ((Oddly, with some reflection, I have observed that I have eaten like a pregnant person since at least 2010)). 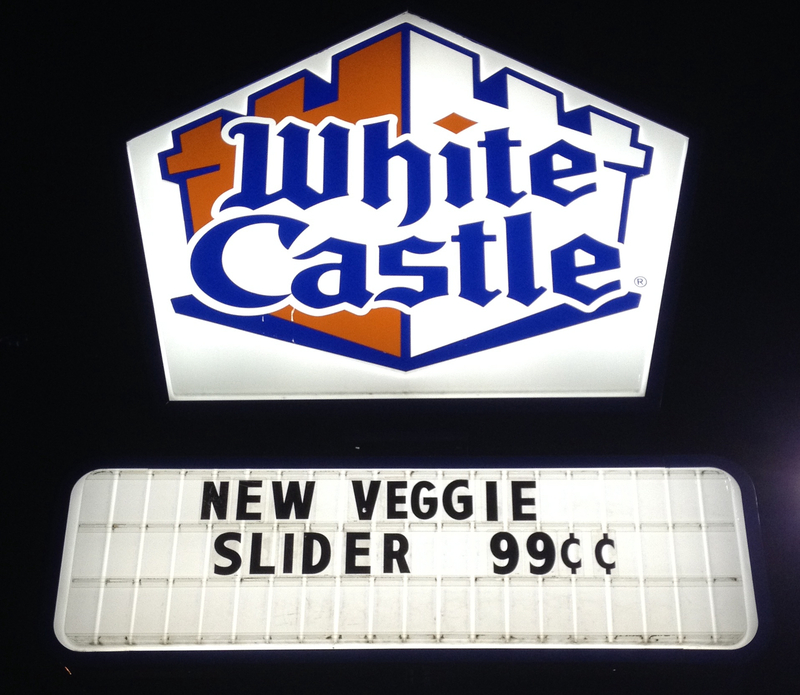 I stalked the White Castle Veggie Slider since I first read about it “coming soon” six months ago. 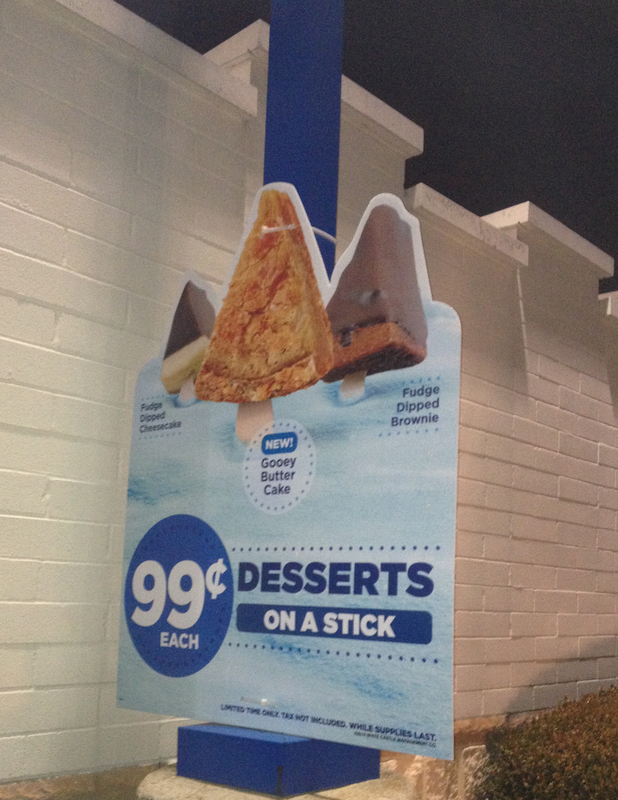 While starting my journey through the drive thru lane I noticed a sign for dessert on a stick! How could I not get a few of those as well. I picked up my order and drove home with an excitement to begin my investigation. My first reaction, after reaching into my sack of research, was a snicker when I looked at the size of the packaging of the desserts. 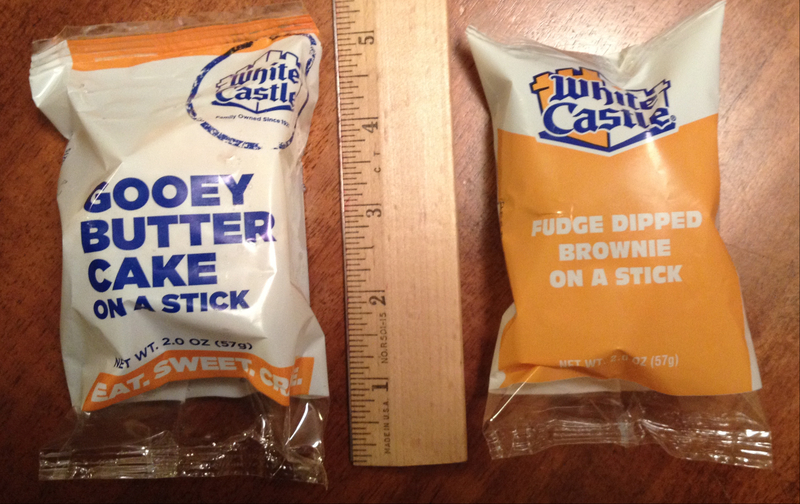 I guess I should have expected something pint-sized from White Castle but I was a little shocked by my first impression on the size of my subject matter (see below). 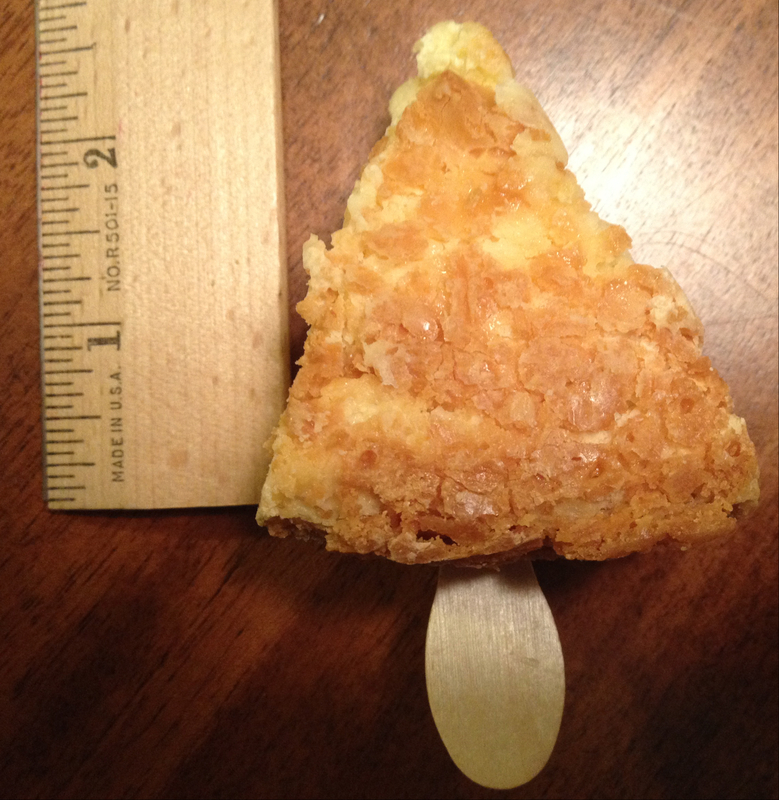 I ordered Gooey Butter Cake and Fudge Dipped Brownie desserts on sticks. While the packages looked small, the prize inside was even more petite. This caused me to laugh a bit more as I walked the treat to Mrs. Gourmand to sample with me. Exceeding both of our expectations these pint-sized desserts were really good. Both had a dense cheesecake style quality and plenty of flavor. For two good bites each, both were well worth the 99 cent price. Excited by being two for two so far in the testing process I proceeded to the Veggie Burger to which Mrs. Gourmand made it clear that her services were no longer available. The first thing I noticed was the thickness of the patty. 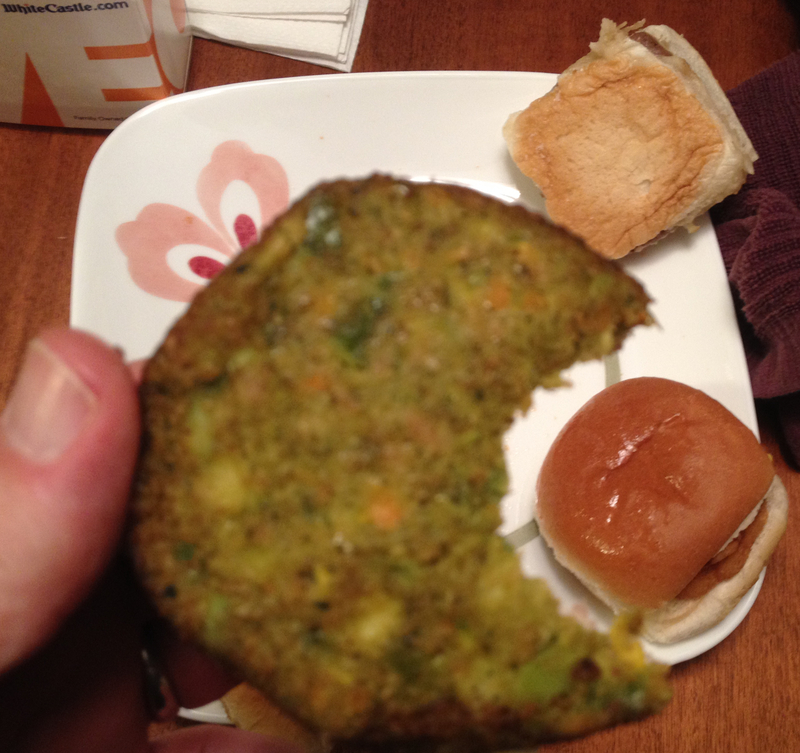 The veggie burger is just over 2 times wider than the standard White Castle slider. My next observation – the burger looks like a burger. It is round. It is the color of a typical burger. While I don’t know the pedigree of the innards, it tastes similar to a Morningstar or other higher grade veggie burger. I also liked the distinct packaging that comes with the product. I’ve sampled many a fast food veggie burger (my favorite hails from the Australian version of Burger King – Hungry Jacks) and this one is a keeper. Although I would suggest ordering this with cheese and seeing if a pickle can be placed on top for extra flavor. The only downside to this (which I noticed on a previous trip) is that the buns on non slider tend to be dry or to have a corner that seems a bit crunchy or stale vs. the alluring steamed moistness of a slider. I have photos of some of my research below. 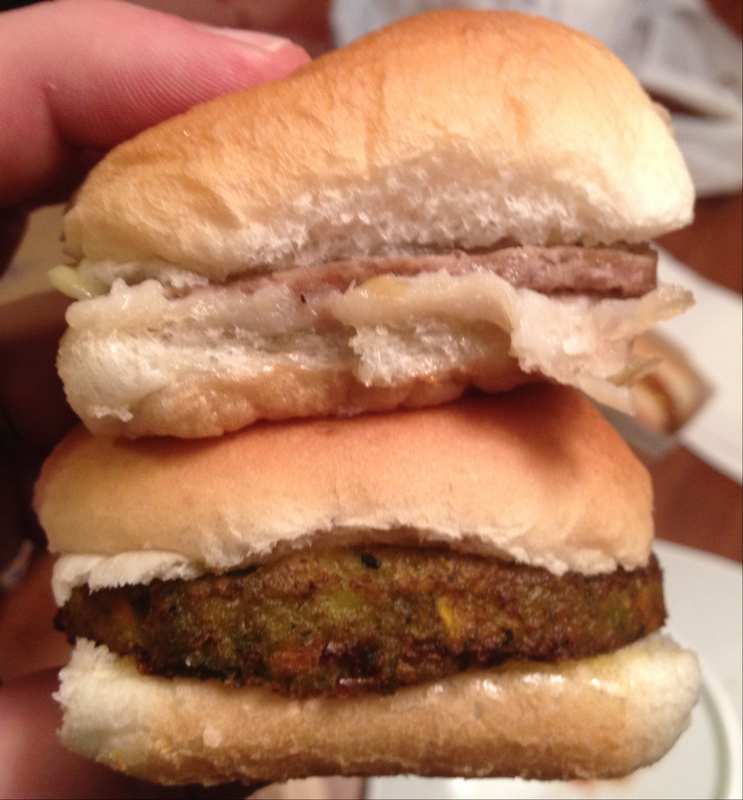 First I compare the size of a veggie slider and a standard slider. You can also see the difference in color. Next take a look at the Veggie Slider box. 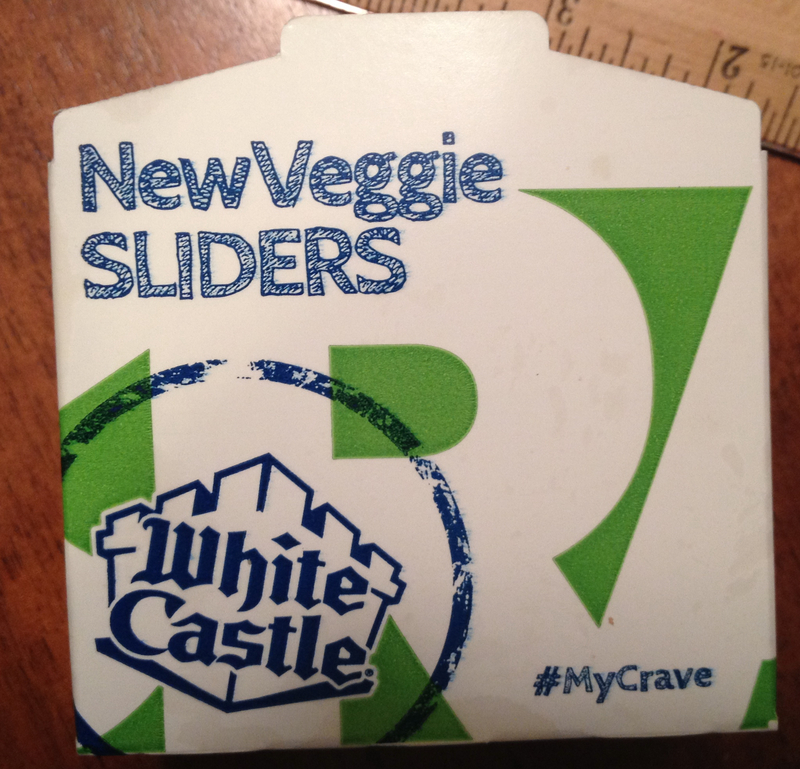 White Castle does a great job with their packaging and branding. The example below is a fine example, nice graphics and color coding to set products apart.